The Classic Sudoku is a number placing puzzle based on a 9x9 grid with several given numbers. The object is to place the numbers 1 to 9 in the empty squares so that each row, each column and each 3x3 box contains the same number only once. Sudoku puzzles come in endless number combinations and range from very easy to extremely difficult taking anything from five minutes to several hours to solve. 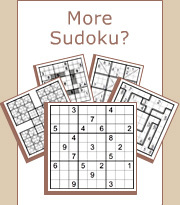 Sudoku puzzles also come in many variants, each variant looking differently and each variant offering a unique twist of brain challenging logic. However, make one mistake and you’ll find yourself stuck later on as you get closer to the solution… Try these puzzles, and see if you can solve them too!